Image: Flavio Ensiki via Flickr. Click for original. Analysts and market research firms have said on numerous occasions over the past several years that the PC market is in trouble, that sales and shipments are down as consumers avoid upgrading for one reason or another. But lest anyone think that PCs aren't not long for this world, the PC gaming hardware market is booming. According to a report from Jon Peddie Research, sales of PC gaming hardware jumped past the $30 billion mark for the first time ever in 2016. Previously JPR had forecast crossing the $30 billion threshold in 2018, so it seems the market is growing even faster than expected. It also underscores that PCs are alive and well, something we've preached over and over in the face of less optimistic market research reports. 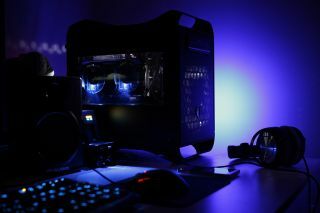 PC gaming tends to drive innovation among CPU and GPU makers, and with PC gaming hardware reaching new heights, companies such as Intel, AMD, and Nvidia should be more motivated than ever to continue pushing the envelope. There are multiple reasons for the sooner-than-expected surge to $30 billion. JPR now breaks PC gaming hardware down into three categories: entry-level, mid-range, and high-end. Each sector is pretty big on its own, though the high-end category pulled in the most money at over $13 billion, accounting for 43 percent of all PC gaming hardware dollars. The mid-range category added another $10.6 billion (35 percent of total spending), while the entry-level contributed around $6.7 billion (22 percent). "We know that gamers with lower budgets are just as passionate about gaming as those with more resources and are enthusiasts in the purest sense of the word, so we decided to transition to a more descriptive terminology. Nvidia and AMD are not ignoring these customers either and offerings like the GTX 1050 bring powerful graphics processing for around $120," said Jon Peddie, president of JPR. Peddie also said he's excited about the prospects of AMD's Ryzen CPUs, which will launch to retail in March. He also noted that integrated graphics on Intel's latest CPUs "now rival game consoles." That last bit is debatable. In a recent evaluation of gaming without a dedicated graphics card on a Core i7-7700K processor, we found that many modern games tended to drop blow 20 frames per second in some parts. Certainly though integrated graphics have come a long way in recent years, which is the bigger point Peddie was making.